Through a mix of tutorials, product demonstrations and keynotes from senior industry figures, the event will bring together some 300 aerospace & defence professionals, to share experiences in relation to the development of international specifications. These specifications seek, in essence, to promote interoperability of information processes; reducing life cycle costs and enabling improved availability of complex systems. If you wish to purchase extra passes for the event, please follow this link. We are delighted to offer a range of sponsorship packages to suit all budgets. All sponsorship packages include: logo and 50 word profile on event app, logo on A6 sponsors tent cards throughout the conference. Full sponsorship package options are found here. Please note that your registration details for the S1000D User Forum will be managed by the Air Transport Association (ATA), on behalf of the three organising partner organisations, the ATA, the Aerospace & Defence Industries association of Europe (ASD) and the Aerospace Industries Association (AIA). Hence, ATA will be responsible for sending all public communiques to the participants list on behalf of the Forum organising body, ADS. 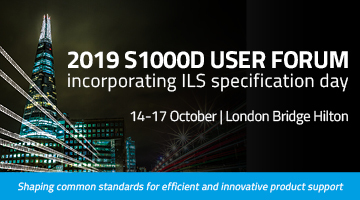 By registering for this event you are agreeing to your contact details being added to the master S1000D mailing list; noting of course that your details will not be forwarded to any third-party organisations - your cooperation is appreciated.